Commercial Commodore 64 Software has been distributed in three kind of media formats: 5.25 inch Floppy Disk, cassette tape and cartridges. Recently archiving old 8bit Software has become a topic with magnetic media dying after an approximated life span of 10-20 years. Emulators of old systems on modern platforms allows for running the classic programs on the latest whiz-bang-state-of-the-art-machine. While the conversion of floppy disks to .D64 disk images is very common, and the .tap format for archiving cassette tapes is becoming more popular, .crt cartridge files of classic cartridge games are very rare. This document tries to give some advice for dumping cartridges to disk files. The dumped files may be transferred to DOS or UNIX binary files using common tools like STAR COMMANDER, and the included utility 'mcart' will convert standard cartridge ROM dumps to emulator usable .crt files. NOTE: Autostarting works differently in Ultimax mode cartridges: As those cartridges have their ROMH lying over $e000-$ffff, they can simply overwrite the hardware vectors at $fffa-$ffff to point to their initialization code. 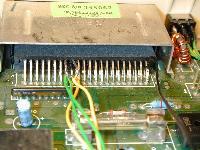 To dump a cartridge you first need to break out of the auto-start loop the program goes into when the cartridge is entered. Normally doing a RESET will just reset the module, but not getting you into BASIC mode. To disable the auto-start you can either modify the KERNAL RESET routine by using a patched KERNAL (like Speeddos does) or disable the GAME and EXROM pins by installing a switch. Your next task is to start up a monitor which will still work with the ROM areas at $8000-$a000 and $a000-$c000 enabled. Now determine which memory areas the module uses and save the cartridge data to disk using the monitor's save command. IMPORTANT NOTE: The Ultimax configuration blanks out most of the RAM and has ROMH lying at a critical area of memory - you don't have access to the KERNAL at $e000-$fff! 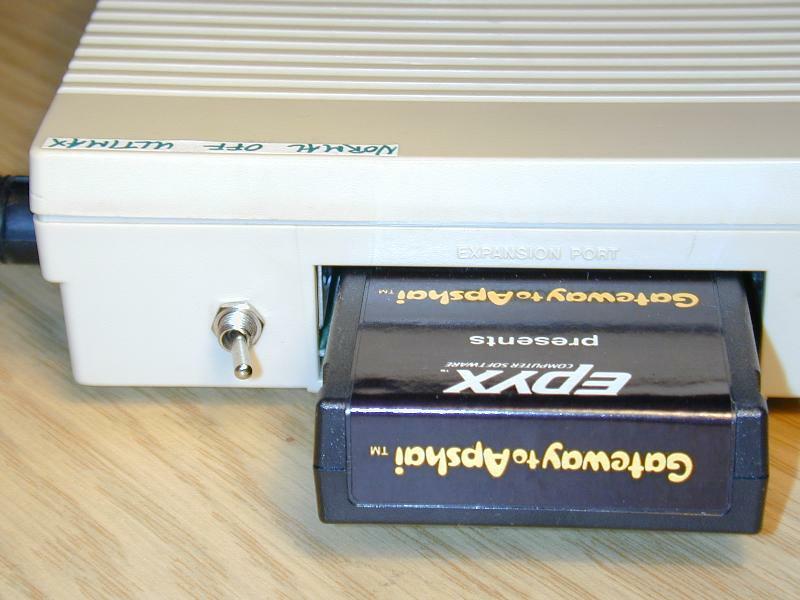 Therefore the replacement KERNAL method won't work with these kinds of cartridges (early Commodore carts, Freezers). For those you must use the switch solution (see below for details). The Ultimax mode poses another problem if you are going to use a switch for toggling between "cart disabled" and "normal" mode: For a fraction of a second, when the switch change states, you don't have defined EXROM and GAME lines. This can lead to Ultimax configuration being enabled for a short time, which is unsecure if the computer isn't in a 'save' state. So during switching you need to make sure the computer runs in a save memory area ($0000-$1000 RAM) and interrupts are disabled. 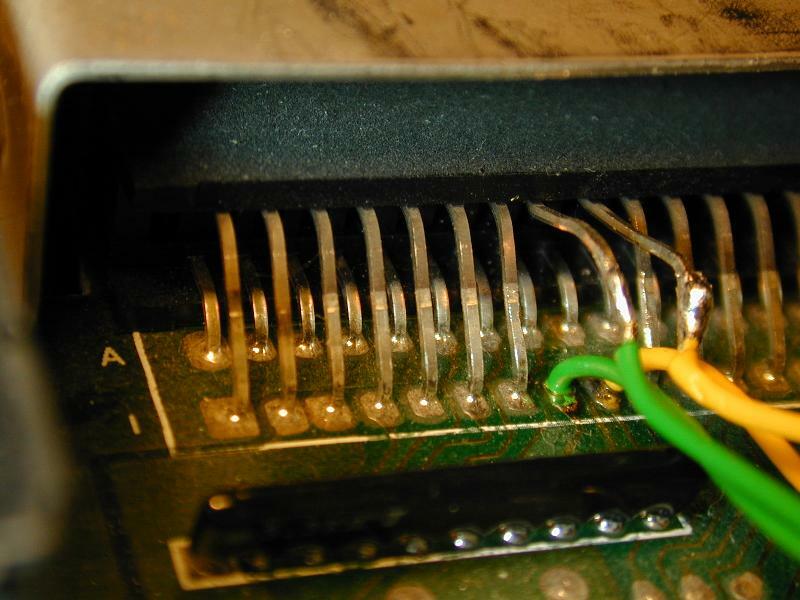 This chapter describes how to install a switch enabling you to turn on/off the cartridge EXROM and GAME lines mapping the cartridge ROM areas over the RAM banks in normal operation. 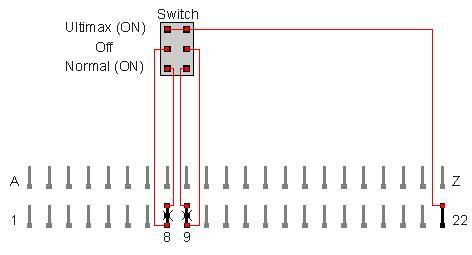 For maximal flexibility use a 3 way 2 pole switch (ON-OFF-ON). 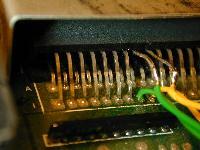 The switch has to go between the C64 PCB and the connector pins. 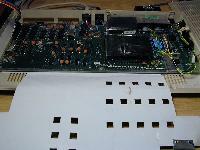 Open up your C64, and remove the screws holding the PCB to the lower casing. Have a look at the module connector: The pins are numbered A-Z and 1-22 on the PCB. Unsolder the pins 8 and 9 and pull out the connector pins of the unsoldered pin holes. Now solder two wires each to the PCB and to the connector stubs. 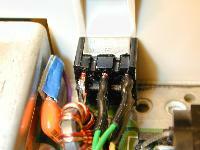 Solder a third wire to the GND pin (22). Note that on my motherboard (pictures below) the pins are actually labelled 1-22 and A-Z, so you shouldn't really be able to make a mistake. the normal connection. This is your standard mode to play the games. configuration is used to dump 'ULTIMAX' mode cartridges. Drill a hole in the housing for the switch if you want to install it permanently and mount the switch. Now assemble everything again and you're ready for cartridge dumping! cartridge running something went wrong with your switch installation. should get the standard blue power-on Screen. 3) LOAD MDUMP from the disk drive you want the ROM dump to be saved to. interrupts disabled makes sure the computer won't crash during switching. ULTIMAX mode cartridges require a slightly different treatment! You can figure out if your cartridge uses ULTIMAX mode by setting your switch to 'ULTIMAX' dump configuration and doing a RESET. If the game DOES NOT run it is an ULTIMAX cart! For dumping that kind of cartridges you proceed like above until step 3. Instead of switching to 'normal mode' in step 4 you need to switch to 'ULTIMAX dumping mode'. By using 'ULTIMAX dumping mode' you pull both the GAME and EXROM lines to GROUND instead of restoring the original cartridge configuration. This way you trick the computer into believing it is using standard 16kB cartridge mode, and you will be able to see the ROMH block (normally in Ultimax mode at $e000-$ffff) at $a000-$bfff. 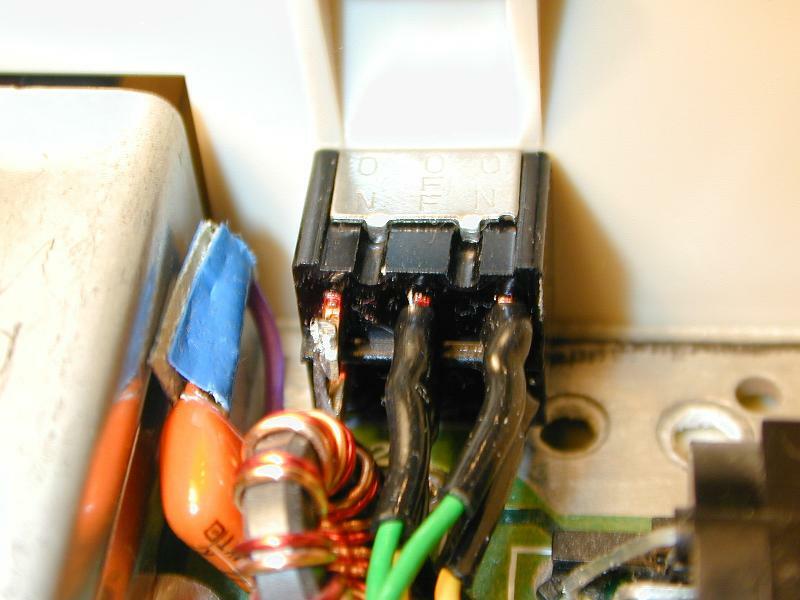 Cartridge Expansion modules usually come with a switch to toggle between different cartridge slots without having to remove the cartridges to change them. You can use such a module to dump a cartridge. IMPORTANT: This method will *NOT* work on ULTIMAX configuration cartridges! slot 1 with the inserted cartridge. the computer won't crash during switching. A patched KERNAL allows you to pass over the standard RESET routine and thus suppress the auto-starting of a CBM80 cartridge. In the following paragraphs I explain dumping carts with Speeddos, but you should be able to figure the process out for other KERNAL replacements with similar functionality. 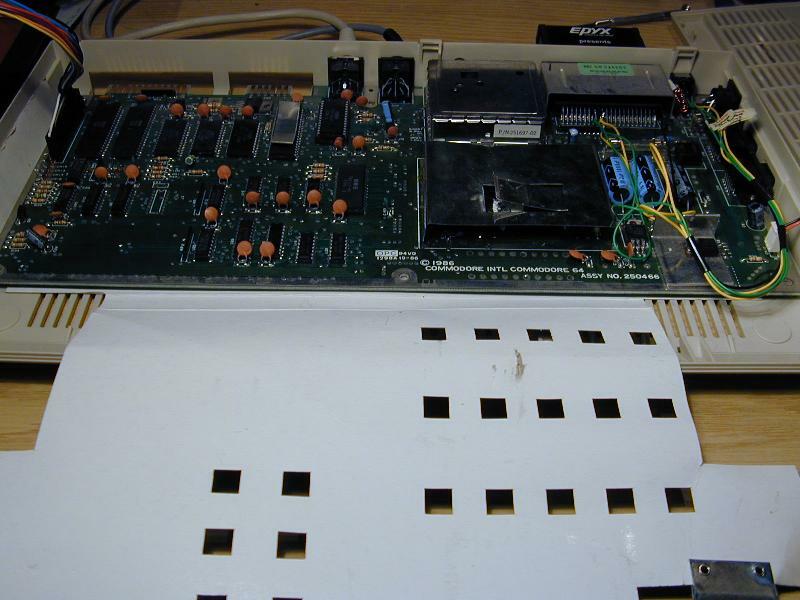 Speeddos has a very useful feature we will use for dumping the cartridge: If you hold the C= key while doing a RESET the machine won't go through its normal RESET routine but will rather go into a built-in monitor program. All you need to do now is to save the memory region the cartridge is using and you are done! 1) Turn off C64. Insert Cartridge. Turn on the machine again. The cartridge should now auto-start up. 2) Hold down the C= key while doing a RESET. Your machine should go into a monitor display, showing the $0801 page of memory. 3) Enter M8000 - after switching to small letters with you should be able to read CBM80 at $8004 in the ASCII representation of the monitor. Now enter MA000 - If the first bytes are $94 $e3 $7b $e3 and you can read CBMBASIC in the ASCII display your cartridge memory range is $8000-$a000. If the $a000 area differs the cartridge range is $8000-$c000. To replace your standard KERNAL by a Speeddos KERNAL you need to build an adapter to replace the 24 ROM DIL chip by a 28 DIL 2764 8kB eprom. COMMODORE 64 PROGRAMMER'S REFERENCE GUIDE, Commodore Business Machines (1982) available in etext form from Project 64. 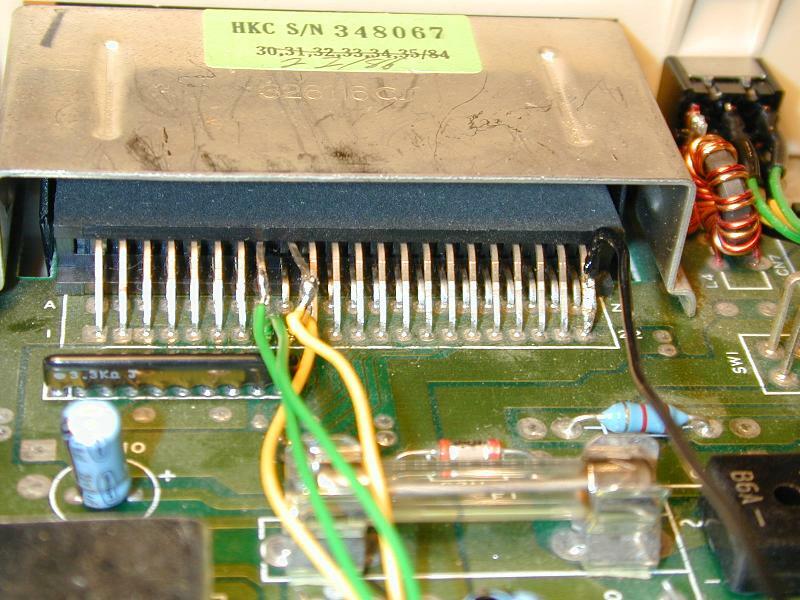 CRT Cartridge Images documentation compiled by Peter Schepers. mcart, tool for converting cartridge dumps to emulator CRT files. ardump, dumping tool for Action Replay and Action Cartridge. (C64 tool). Does this work? fc1dump, dumping tool for Final Cartridge I. (C64 tool). Does this work? dzaxxon, dumping tool for Zaxxon and Super Zaxxon by SEGA (C64 tool). For Warpspeed use the ordinary mdump tool.